I thought a great deal about whether or not to include this article at Hypothyroid Mom because I prefer to avoid politics here on my site. However in the end I decided to post this article. Here’s why. Hillary Clinton is being treated with natural desiccated thyroid (NDT) for hypothyroidism – a kind of treatment which most mainstream doctors refuse to prescribe even when their patients still have hypothyroid symptoms after being treated with the standard medication. It is not fair that this is an option only for patients who can afford to pay out of pocket for doctors open to prescribing NDT. I was fortunate to find a doctor open to exploring the thyroid treatment options. NDT changed my life. I want every person offered the various thyroid medication options to find what is right for them too. There is a chance that the next US president will be a woman. And on top of that a woman with hypothyroidism – a disease that many women suffer from. When Hillary Clinton’s presidential campaign was kicked off, a lot of information about the candidate was published – everything from tax records to health status. Her doctor, Dr. Lisa Bardack, confirmed that Hillary Clinton’s physical condition is excellent, and that if elected she is fit to serve as President of the United States. Isn’t that amazing? You can be fit enough to contest the office of President of the US – even if you have hypothyroidism, a disease that can otherwise ruin your ability to think clearly or remember things, and can even make you prone to depression – unless of course you are adequately treated. It has been reported that Hillary Clinton takes antihistamine and vitamin B12. No big deal – antihistamines and B12 are commonly used. However, the presidential candidate also takes Armour Thyroid – natural desiccated thyroid hormone (NDT) – as treatment for her hypothyroidism! Now, I know several people who are being treated with Amour Thyroid – and they all function superbly and have no symptoms of hypothyroidism. So for me, it’s “no big deal” that a US presidential candidate is being treated for hypothyroidism. I do not doubt Hillary Clinton’s mental abilities – she’s sharp as a razor. Yes, it is possible to still have all your mental capabilities intact even if you have hypothyroidism – you just need to be adequately treated for it. So for me it’s no big deal that the presidential candidate is treated with Amour Thyroid. But for the health care system, this is a big deal because this is a kind of medicine that many patients are not “allowed” to try. And hopefully this is going to change now that it is public knowledge that Hillary Clinton takes this kind of medication. I have seen so many examples of patients who do not thrive on the standard T4-treatment, e.g. Synthroid. Even though they still have all the symptoms of hypothyroidism, they are not “allowed” to try other kinds of medicines, e.g. Liothyronine (T3) or NDT (which contains both T3 and T4). Unfortunately, this comment is not unique. 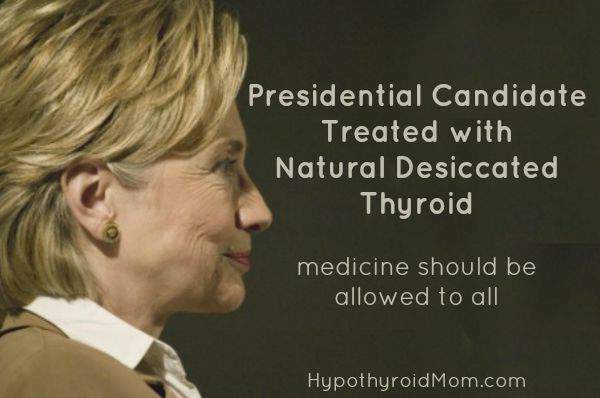 Again and again, I hear of thyroid patients who are not allowed to even try this particular treatment that the US presidential candidate is taking. Etc.. etc. … and all such statements come from highly educated specialists even as all of them seem rooted in ignorance which is proof that myths do exist among many doctors and specialists because these statements are simply untrue. Nevertheless, these myths are the reason why so many patients, who don’t do well on the standard treatment for hypothyroidism, are not allowed to try NDT. This treatment helps one the American presidential candidates become eligible for this demanding office despite her illness. And so much for being treated with something compared to chopped rats and mice or something that can transmit diseases from animals to humans! The fact of the matter is, this woman is getting the very best treatment for her illness. Ok, I know that not all hypothyroid patients need NDT. Some are doing just fine on T4-treatment. And I am not saying that all hypothyroid patients should be treated with NDT. But frankly, if those who do not get any better by being treated with Synthroid are not allowed to “try out” other kinds of medicine, then something is wrong. And yes, of course, NDT can be hazardous to your health if overdosed. But all medications can be hazardous to your health in any wrong doses. Therefore, I have some advice to doctors who do not yet know about NDT: Contact a doctor-colleague who has had the experience. Or call the manufacturer and ask about the start-dosage. There are many ways to acquire new knowledge. And for the endocrinologists who are only interested in treating all hypothyroid patients only with T4-medicine, I have something for you as well: Please consider the option of not taking any more hypothyroid patients into your clinic. For what have you to offer if you are really not interested in letting these people try out some other kind of treatment than what they already got from their GP? I have never heard any endocrinologists say that “all patients with hypothyroidism are feeling healthy when treated with T4-only medicine”. Endocrinologists are quite aware that there is a large group of hypothyroid patients who never really get better even though they are being treated. The question is what to do with these patients. Should they just leave the labor market and get disability? Should they be sent to a psychiatric ward? Yes, there are many options. But frankly, wouldn’t it be a better option to try NDT first before the patient ends up on antidepressants and disability? To be fair, there are doctors who let patients try out therapy with NDT, except that there are not so many of them – and unfortunately this seems to be the case worldwide. Why is there such apprehension among many doctors when it comes to trying NDT (or a combination treatment with T3)? Helle Sydendal is a journalist, patient advocate, debater and author of the Scandinavian bestseller, now available in the US, From Hypothyroid to Healthy: Get Your Life Back with Successful Diagnosis and Treatment. Helle runs the blog From Hypothyroid to Healthy. She has hypothyroidism and Hashimoto’s and unfortunately, standard T4-medication did not improve Helle’s condition. It was quite a challenge for her to find a doctor who would give her the right treatment. However, today, Helle is adequately treated for hypothyroidism; she is thriving and could not feel any healthier.